Hi ,my name is Marielle from New Brunswick, Canada and I am delighted to have been invited here today as your guest designer.I had the pleasure of working with samples of the Bewitched collection. Sadly, my 11 year old boy is no longer into the cutesy Halloween costumes. He says the gorier the better and I’m sure it will be more of the same this year. 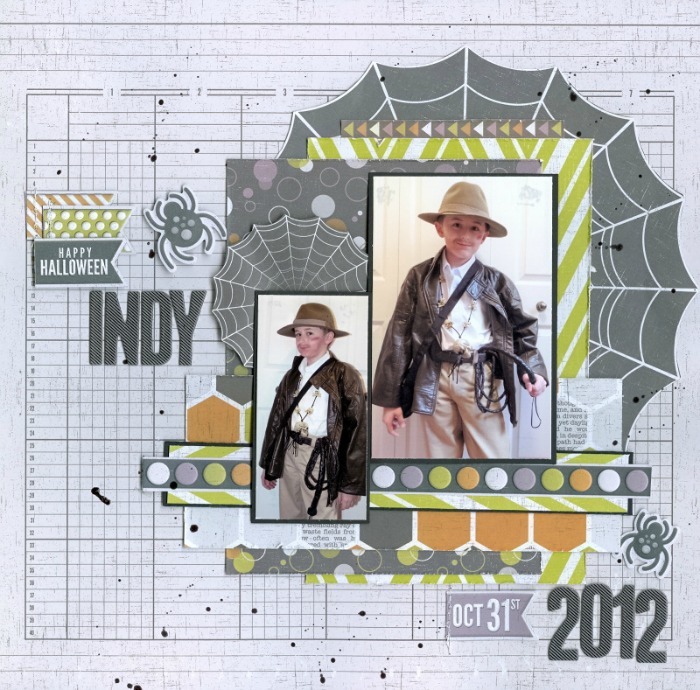 For this reason, I chose to stick with the spider/ web theme for my layout of him dressed up last year as Indiana Jones . I started by cutting out the large spider web (it measures around 7 1/2″ in diameter) and used it as the base of my layers of patterned papers. I also used the banner and spider embossed stickers as embellishments, I always adhere my stickers to cardstock and trim off the edges before adding them to my projects. 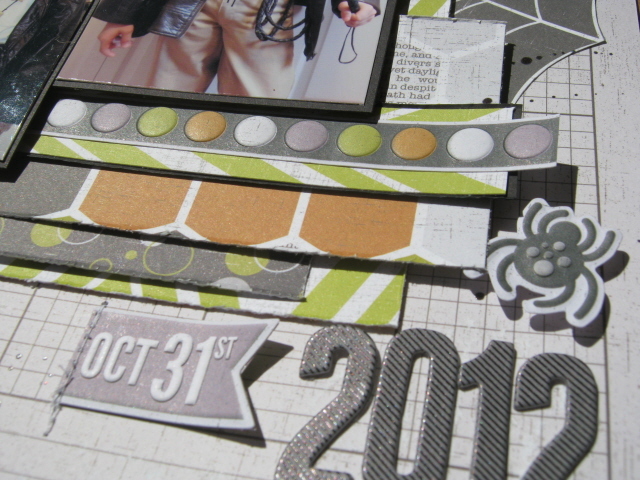 I finished off my layout by adding the title, date and a light splatter of black Glimmer Glaze. As the weather begins to cool down, hopefully your schedule is a little less crazy with summertime activities (I hope). 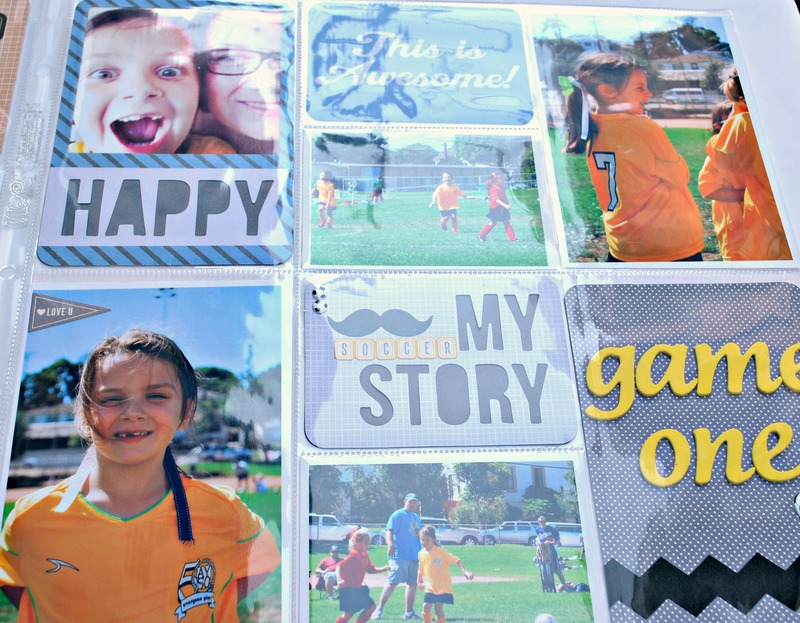 It’s a great time to print some of your favorite summer photos. 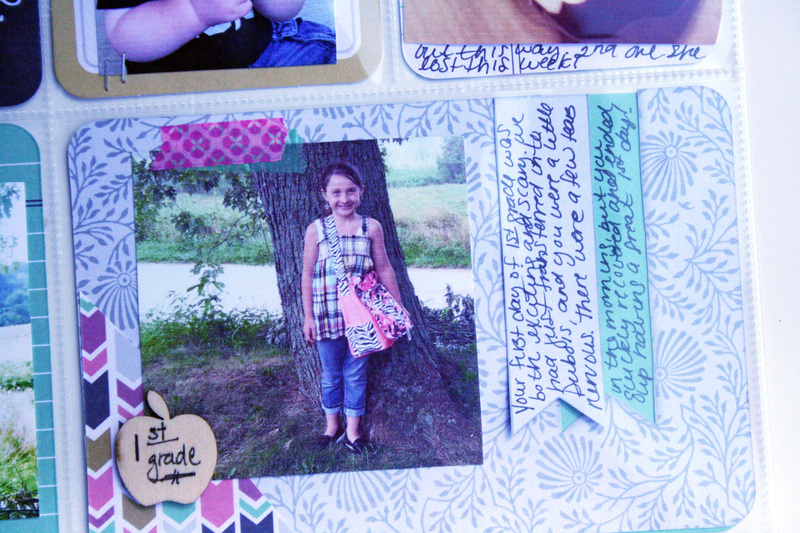 We R’s designer Shemaine used the Albums Made Easy system to create quick scrapbook pages with her summer photo favorites. Punch Boards make it easy, not to mention cost effective, to create party bags and boxes simply by punching and scoring using any paper. Create bags and boxes in a variety of sizes and use them for special occasions such as baby and wedding showers, birthdays, holidays, party favors, and more. 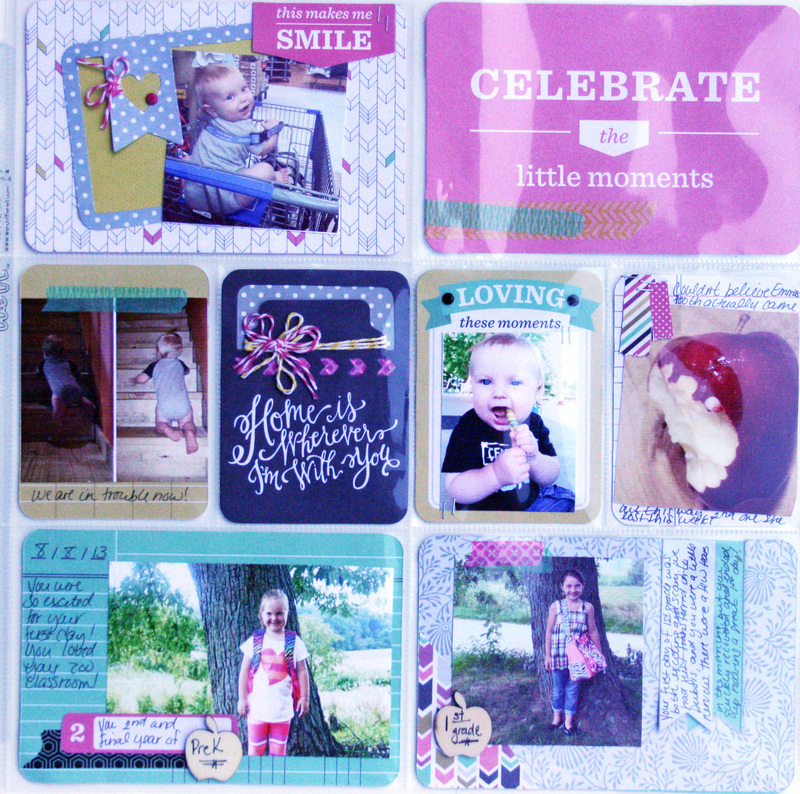 Use the Punch Boards to create Gift Bags, Gift Boxes, Pillow Boxes, and Candy Boxes. Check out this how-to video to see how it works. The Punch Boards shipping mid-October. My hubby and I love our date nights. And I often save tickets, programs, and other memorabilia from our dates to include in my memory keeping. Sometimes it’s a challenge, though, to find effective and creative ways to include these items on my pages. I was able to include this concert ticket on my page using the Corner Mounter, and now I can remove it without any problem if I’d like to show it to our kids when I tell them the story of our date that night. The Corner Mounter is easy to use. Just add your paper between the magnetically attached plates–they hold your paper securely in place when cutting the corners. Line up your paper using the paper size guides marked on the top clear plate. Choose your blade shape–straight, rounded or stub–and press the blade into the holes to cut the corner slits on your paper. The Corner Mounter is great for all kinds of memorabilia (tickets, awards, postcards, artwork, holiday/birthday cards, etc) and vintage/heritage photos that you don’t want to use adhesive on. 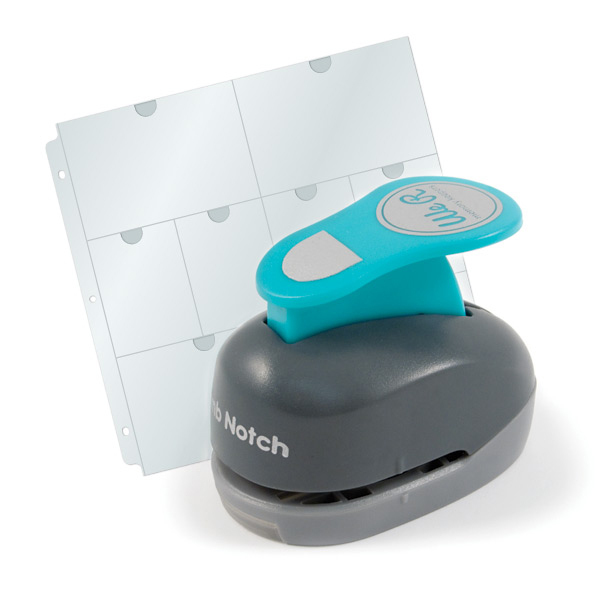 You could also use it for business cards, or a rotating photo display–simply pull out and replace photos in the corner slits on the display. Creative cheers! 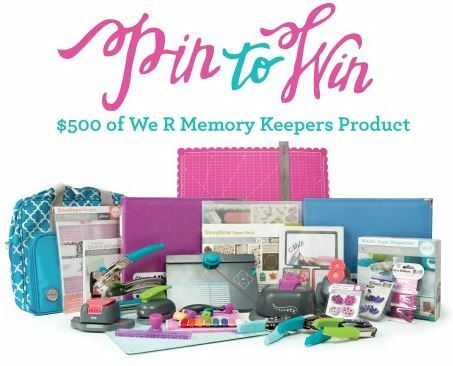 Here’s a super cool and easy way to win $500 of We R Product by pinning your favorite projects on Pinterest. 3. Click on the “Pin to Win” board (it’s the first one) and pin your favorite projects. Start pinning and share this with your friends. My name is Christine Meyer and I’m from rural Illinois. 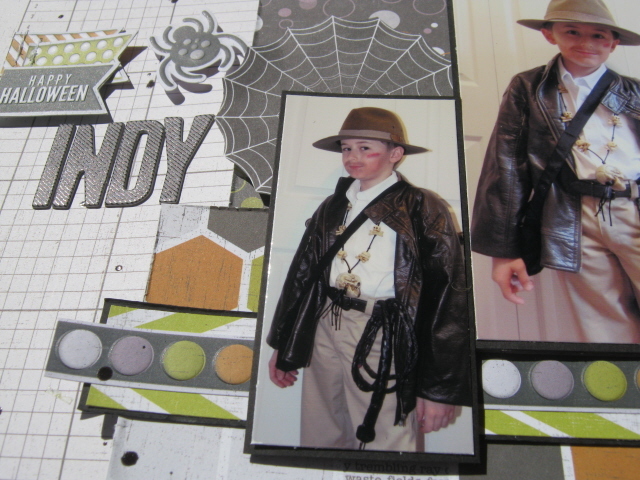 I’ve been scrapbooking for about 9 years and love to create projects of all sorts. 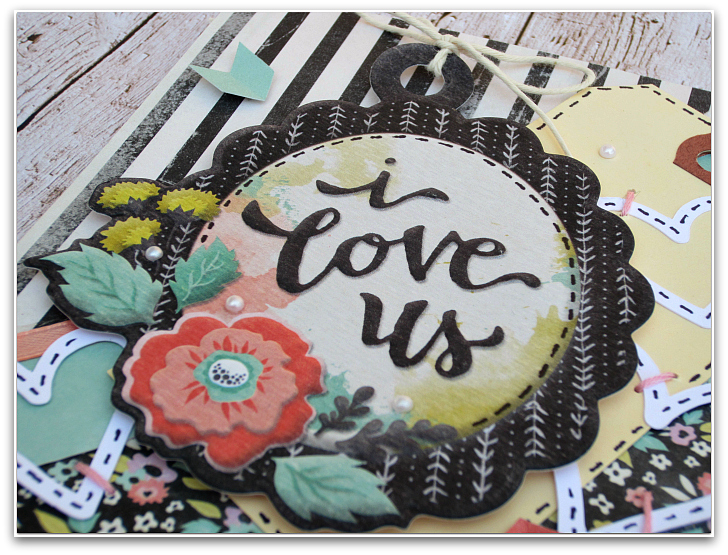 I’m thrilled to be featured as We R’s guest designer today and I have three fun cards to share with you! 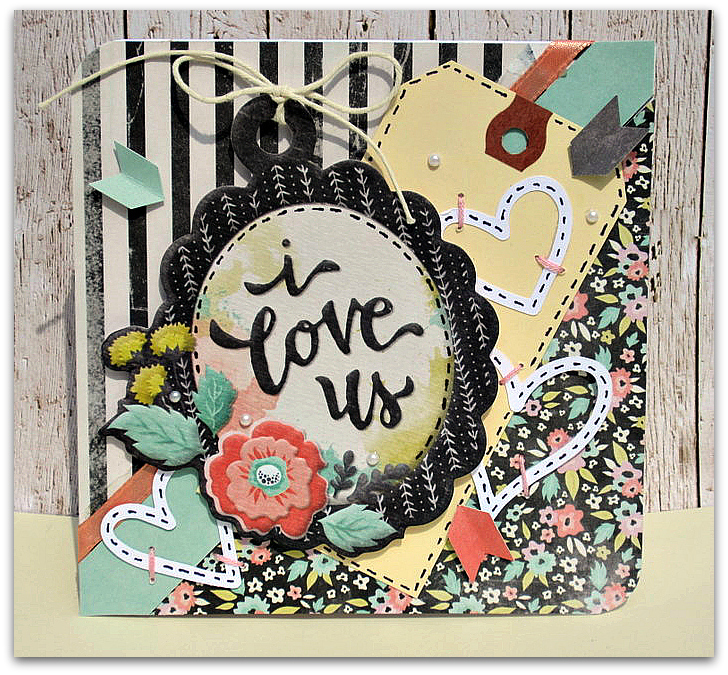 The Chalkboard Collection was a blast to work with and was perfect to make beautiful, classy cards! 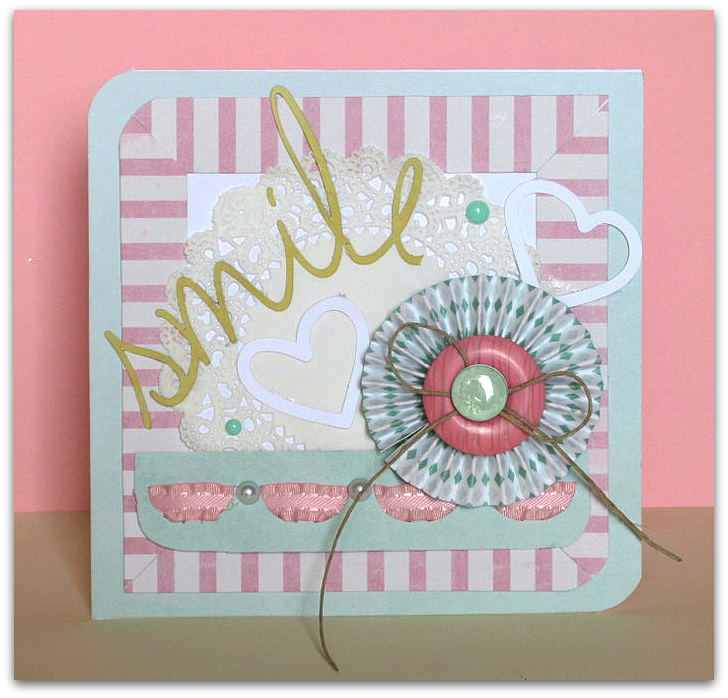 All three of my cards are 5 1/2″ X 5 1/2″ and make use of the Corner Chomper to keep things from being too square :). Cut Watercolor and Polka Dot paper on diagonal and add it to each corner of the paper. 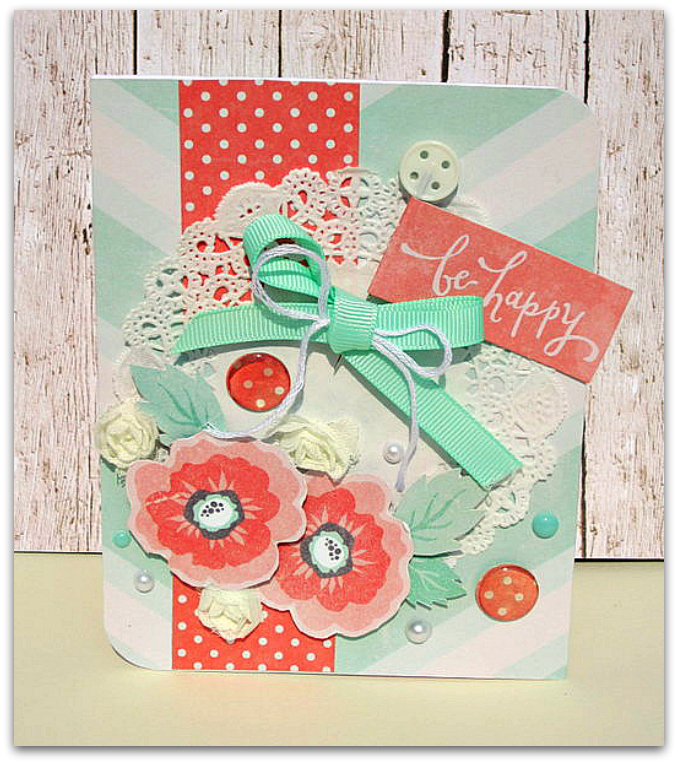 Fussy cut flowers from the Watercolor Paper and add those along with coordinating embellishments. Cut 1 inch strips of the Acrylic paper. Line them up to create a border – miter the edges if you’d like to really make them schnazzy! Add a doily slightly off center. Use the Sew Easy Ribbon tool to create a border using ribbon and pearls. 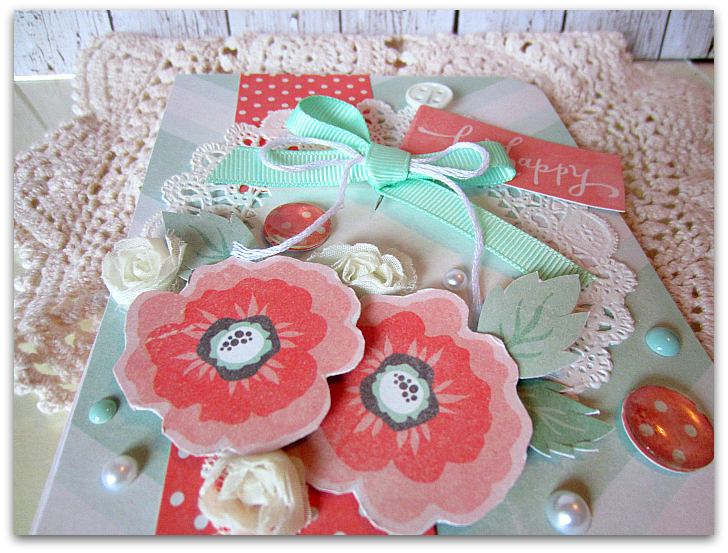 Create a medallion flower from the Acrylic paper and attach it to the card topped with button and a twine bow. 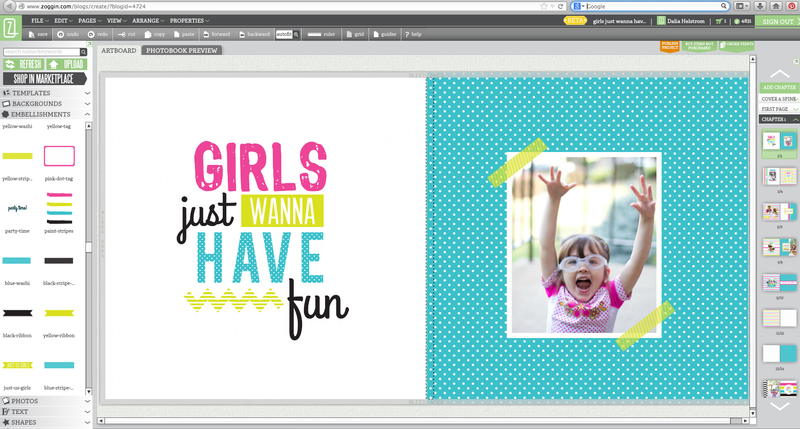 Have you ever considered creating a digital photo book, greeting card, or calendar? We have some exciting news for you. We R Memory Keepers has partnered up with Zoggin. So more about Zoggin. Zoggin is a new website that allows you to digitally create personalized projects through the Zoggin platform. It uses an intuitive drag and drop system so you can create without boundaries. Users simply select a project type and size, add digital elements such as artwork, personal photos, and text and drag and drop these elements onto an art board. You can design your projects from scratch or you can use designer templates to help save time. 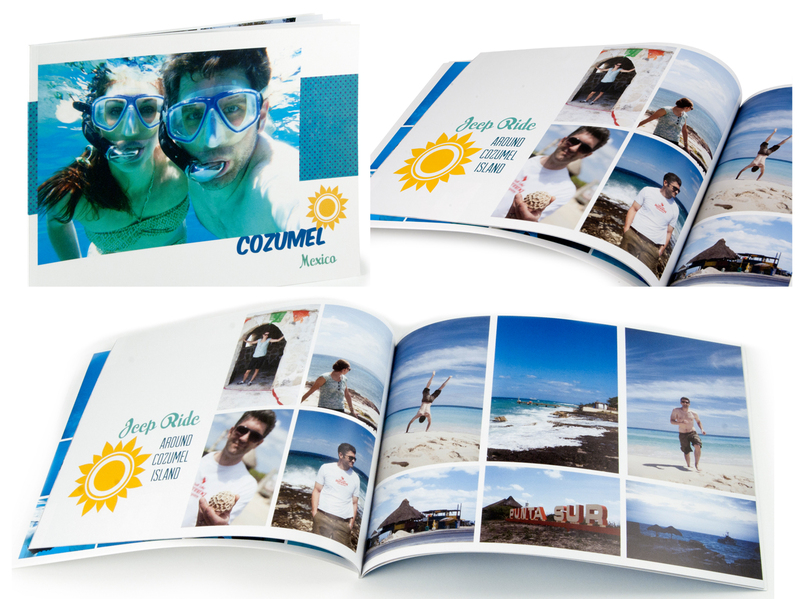 Once your project is finished you can have it professionally printed and shipped straight to you. Zoggin’s Marketplace has thousands of design elements, so you can search and find exactly what you are looking to make your project complete.We R Memory Keepers has tons of designs in the Marketplace so you’ll be able to find your favorites to use on your projects. You can use your 500 free Zoggin points from signing up and start shopping in the Marketplace. I created this cool photo book and a printed a few copies for myself and as a gift for my family. It worked out great. 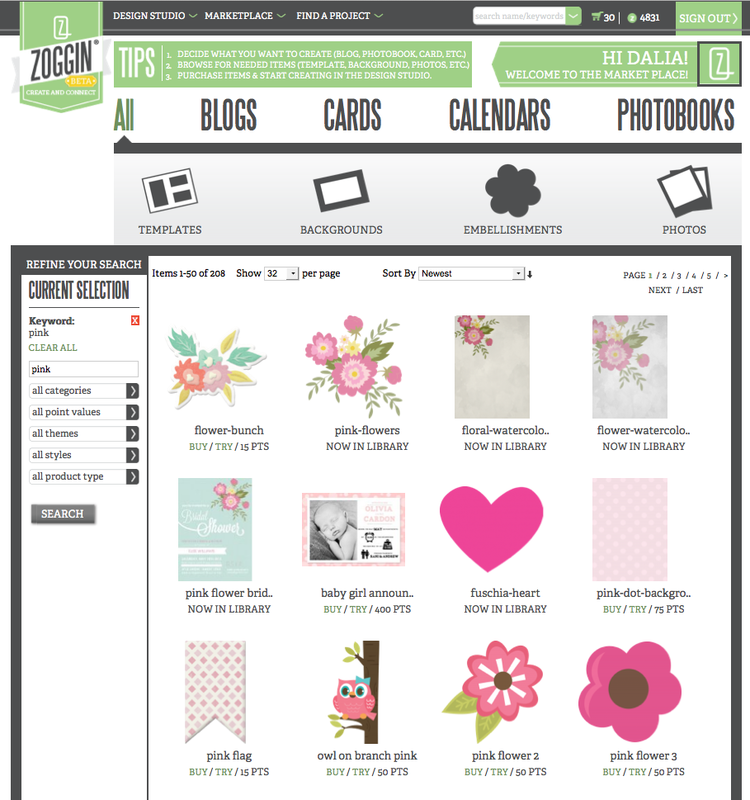 Zoggin also helps designers showcase their artwork while earning recognition and extra cash. Designers can turn the artwork they already have such as wedding invites, posters, web design and announcements, among other things, into a profit by adding them to the Zoggin Marketplace. As a designer, they can upload their digital artwork and set the price for users to purchase. Every time their artwork is purchased, the designer earns money and recognition for their work. AND if you sign up today and post a comment letting us know that you’ve signed up, Zoggin is also giving away a Zoggin jacket to one lucky winner. Become a fan of the Zoggin Facebook page to see cool project ideas and inspiration. Check out the video below where I introduce the handy new Thumb Notch Punch and demonstrate some of its many uses. I love the Albums Made Easy system. 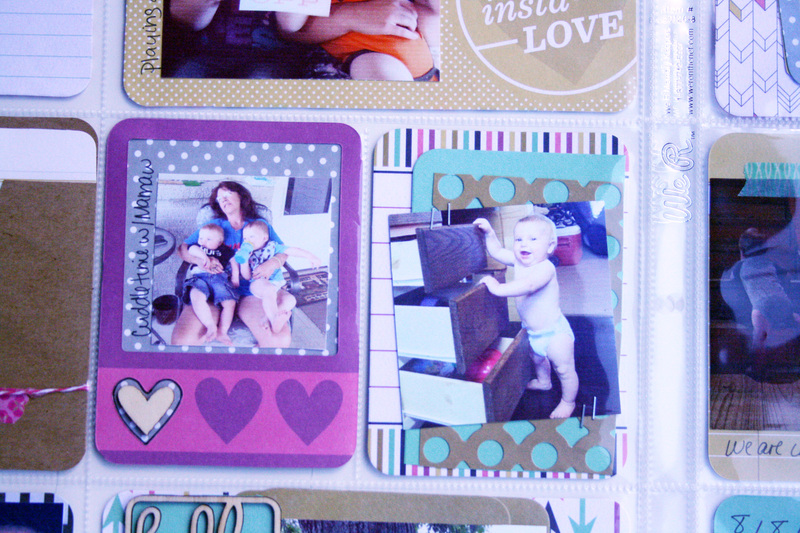 It makes for great work with quick scrapbooking, which is very helpful for all of the busy days we seem to have anymore. 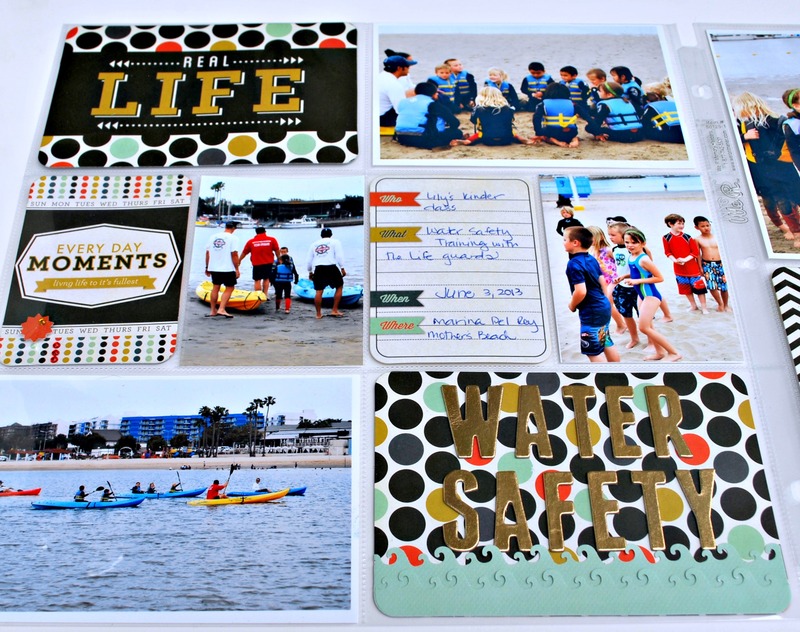 I love using the Albums Made Easy system to do a monthly review of events, activities, etc. Things that are maybe more everyday, that I might not spend the time to do a full 12×12 layout on. That’s why I love this system, I can still get crafty and creative, but quickly document moments that otherwise would get left behind. This is what I created as my August month in review. I prefer to keep my spreads more on the flat side, I add in things like brads, wood veneer, twine, to get the texture and dimension that I love, but as a general rule, I try not to over embellish. One of my favorite ways to embellish on these spreads, is to cut apart those journaling cards, and use bits and pieces as accents, layers. I also love to fussy cut around banners, and tuck things under them. As you can see in these photos. Its a great way to add interest and give the illusion on there being more dimension than there actually is. 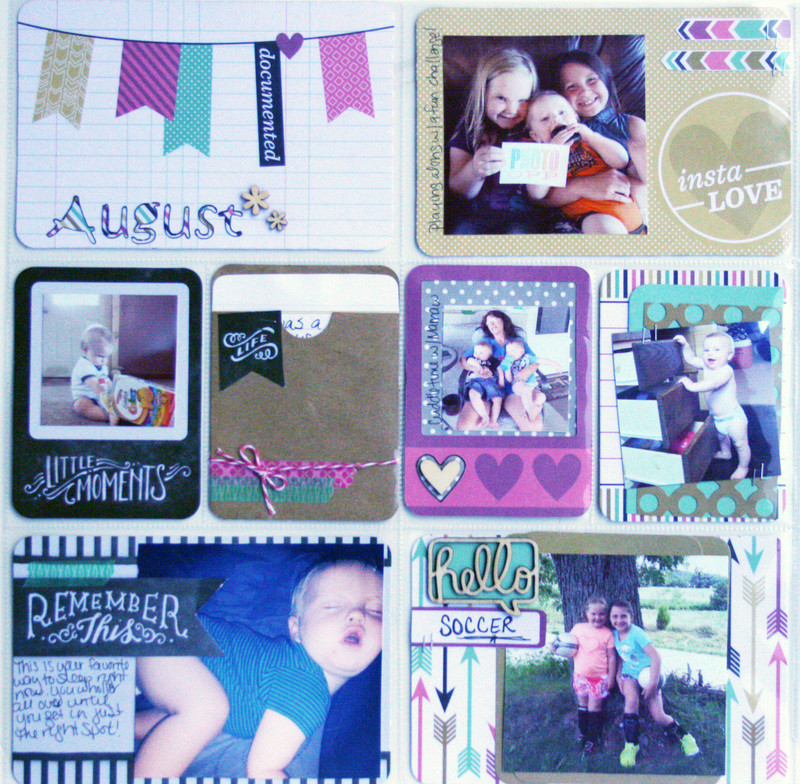 Try scrapbooking a month in review to see how fun and easy it is. We’ve made it to Friday! Hooray. What do you have planned for the weekend? If you have a get-together or party planned, it’s not too late to create an adorable centerpiece for your table. This project was created by We R’s designer Ann Corbiere-Scott. Follow these simple instructions to create your own pinwheel. Find a flower pinwheel template (we found this template here). I wanted mine a bit smaller so I traced the inside of the pattern with a highlighter and cut along the inner most line. 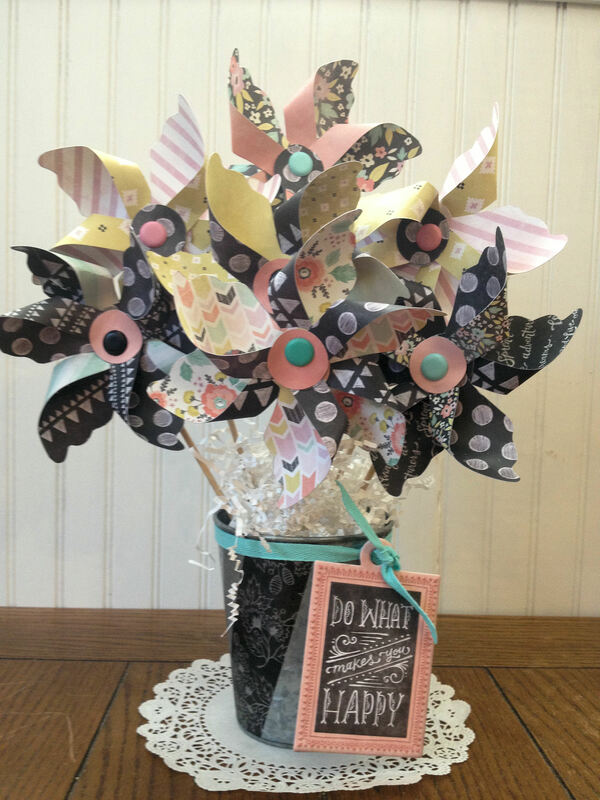 Cut two wheels per flower using double sided patterned paper. The 6×6″ paper pad works great for this. Stack 2 wheels making sure all of the spokes are going in the same direction, adhere both pieces together at the center. Bring each petal to the center of flower and adhere. 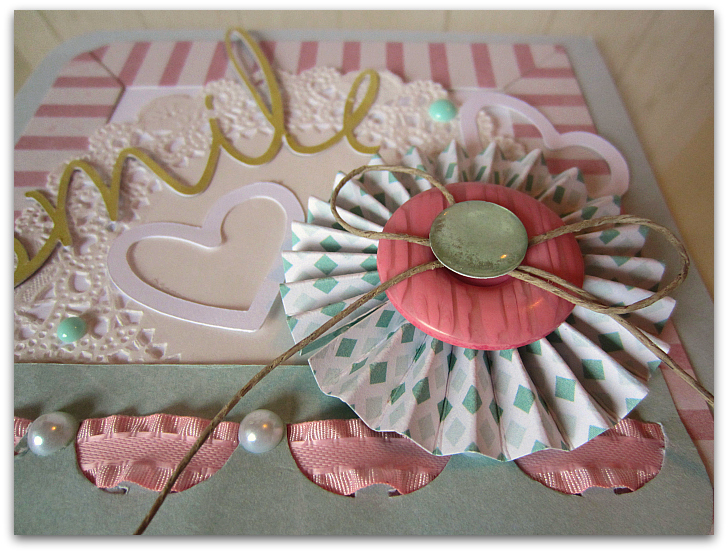 Once all petals are adhered to center, cover the center with a punched circle from a coordinating patterned paper. Punch a hole with Crop-A-Dile, in center of flower, insert a big coordinating brad to hold everything together. Adhere flower back to a bamboo skewer. Cut strips or shapes from Washi sheets and embellish container. Place a piece of Styrofoam inside container and stick pointy end of each skewer into Styrofoam. 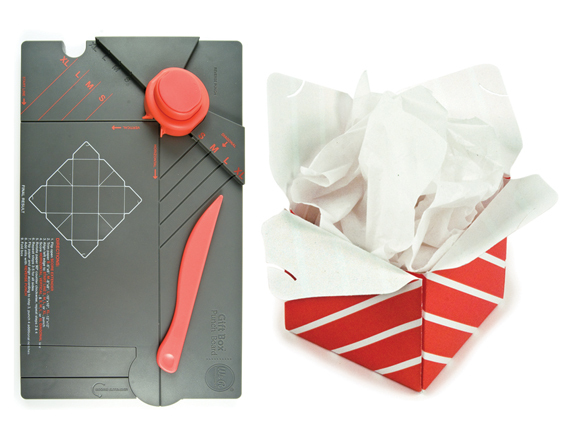 Cover Styrofoam with crinkle cut gift bag filler. Tie an embossed tag with twill trim around container.